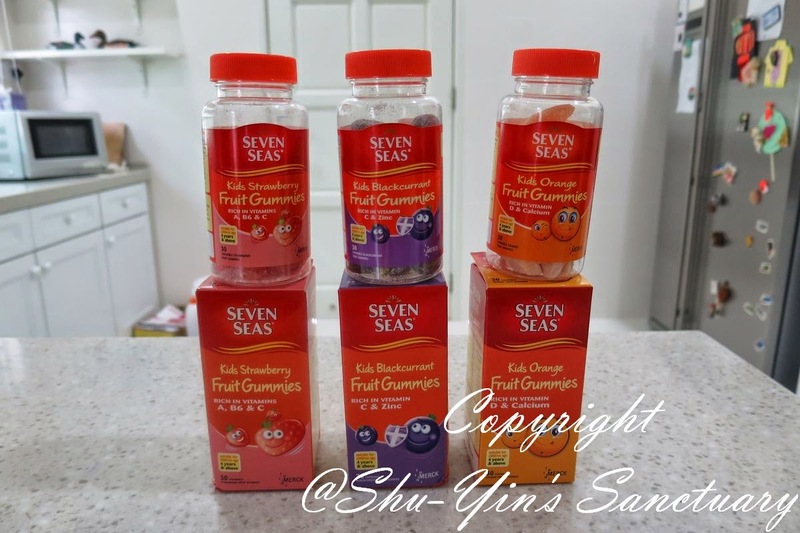 Shu-Yin's Sanctuary: Review: Seven Seas Fruit Gummies - Yummy and Nutritious! 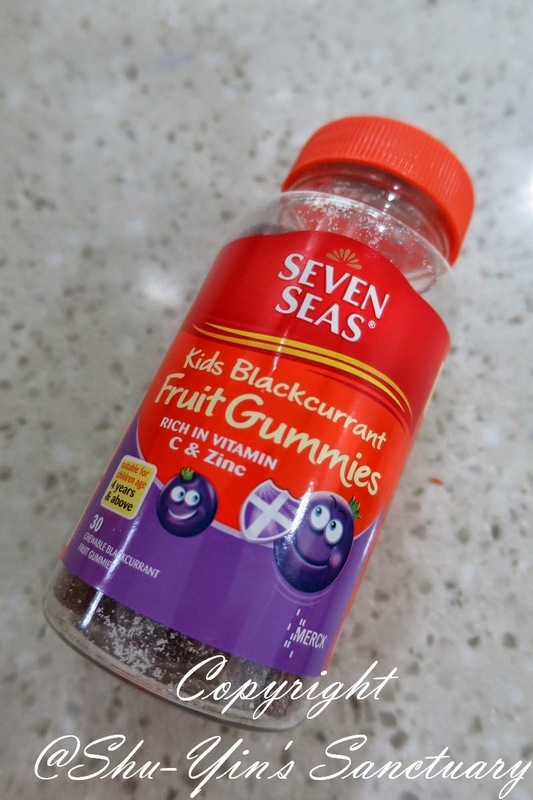 Review: Seven Seas Fruit Gummies - Yummy and Nutritious! We received a happy mail last week. Upon opening the parcel, my kids got more excited than me. 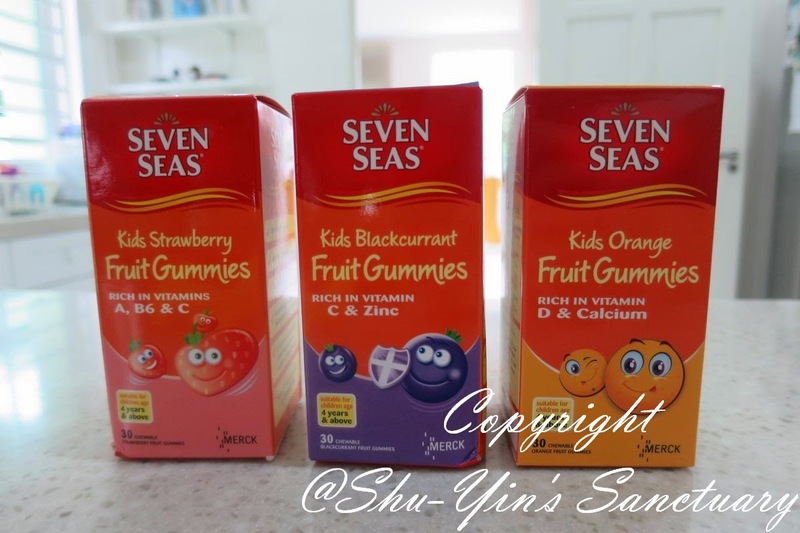 Because we received Seven Seas Fruit Gummies! SO WHO IS SEVEN SEAS? 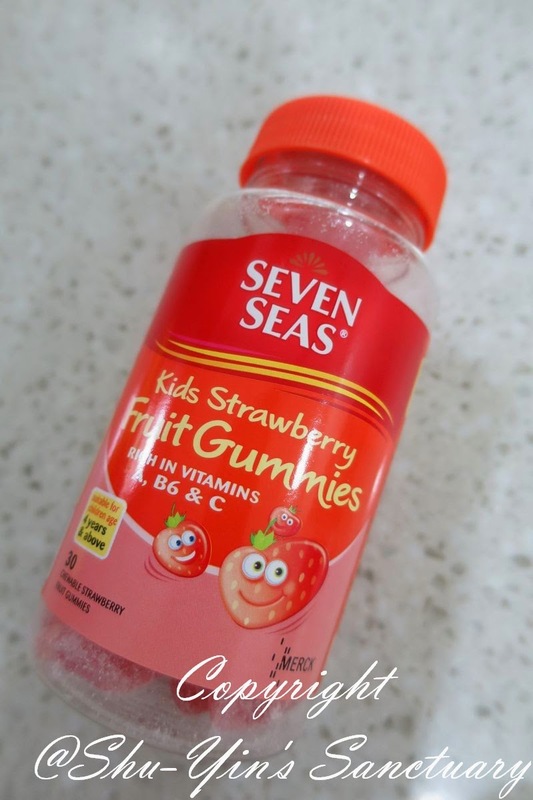 Since 1935, Seven Seas has been researching and developing the right formulation to meet the needs in supporting good health for families. The Seven Seas story begins with cod liver oil, and the history goes way back to the 1700s. 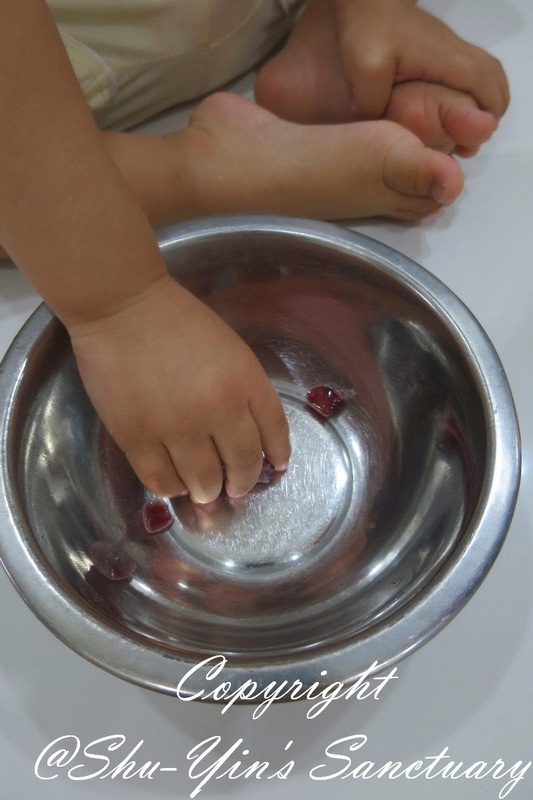 Seven Seas believes that a healthy life begins with good nutrition. Driven by this philosophu and back with scientific expertise, Seven Seas is committed to bringing good nutrition for you and your family since 1935. Today, Seven Seas health supplements are sold in more than 100 countries worldwide. Seven Seas nutritional range is designed to support your health to ensure a fulfilled day with busy schedules and activities. Seven Seas Flexicare range is formulated to provide nutritional health for the joints. 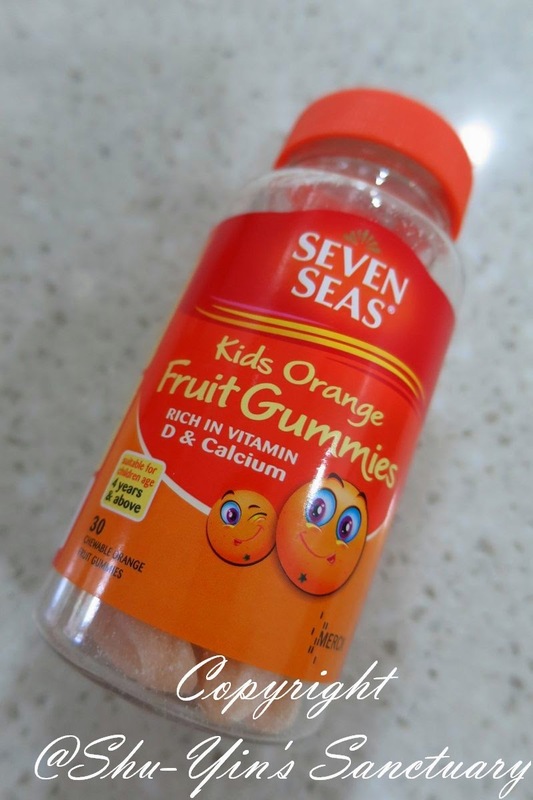 Build a strong and healthy foundation for your child with Seven Seas. 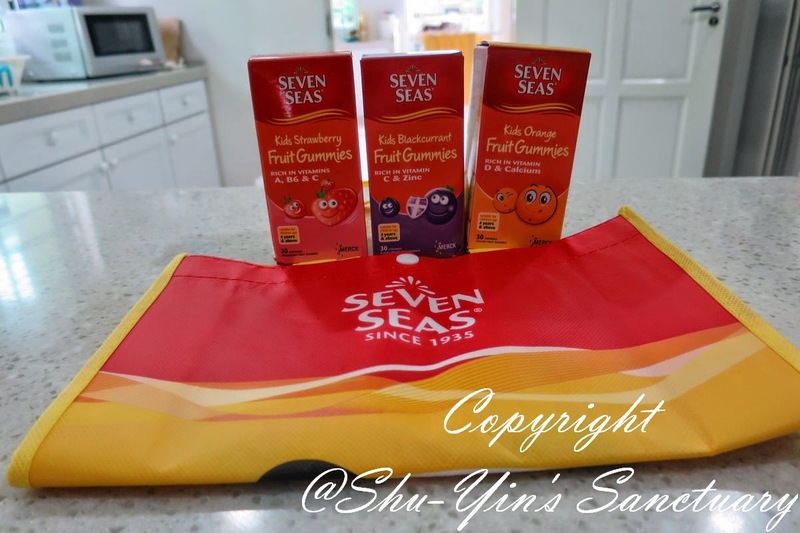 Upon opening the parcel, we saw a reusable Seven Seas bag. And in it, I also found an Activity Sheet. (more about that later). And of course inside the bag, there are the 3 boxes of Fruit Gummies. 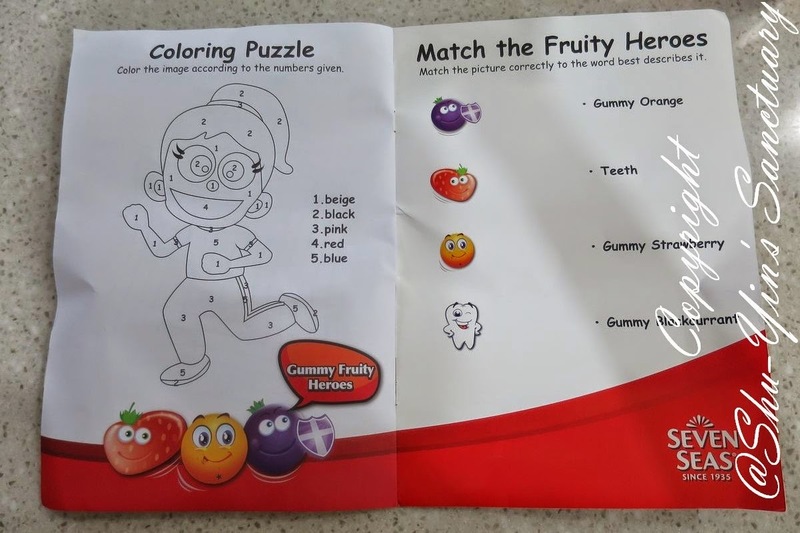 These are the different Fruit Gummies flavours. Inside the sealed boxes, they contained the gummies packaged in plastic transparent bottles. The transparent bottles are good for easier identification after I discarded the boxes. The flavours names are also bold and clear with the different colours for easy identification - Red for strawberries, purple for blackcurrent, and orange for orange! Now these are the Fruit Gummies bottles in more detailed. 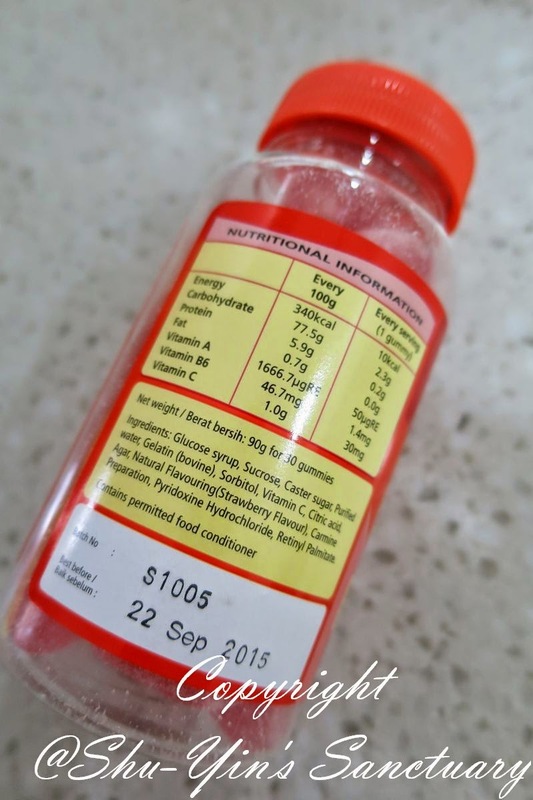 Their nutritional ingredient are also listed at the back of the bottle, with clear expiry dates. I like that the expiry dates are printed on the bottles, and not on the boxes like some because I tend to discard the boxes. 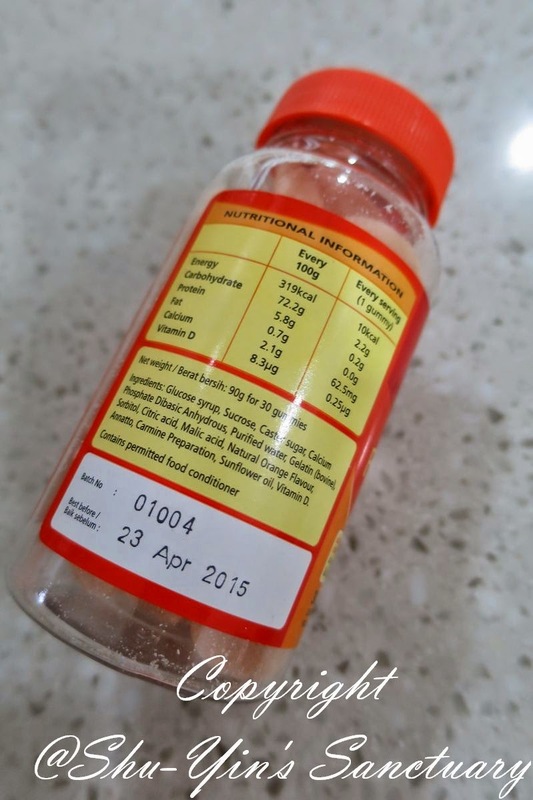 Clear instructions are also printed on the bottle. 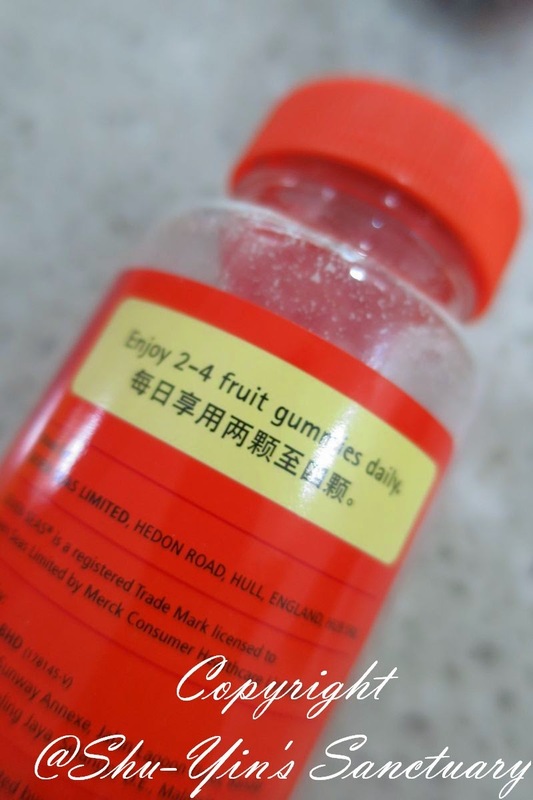 It is also printed on the bottles that these gummies are suitanle for children age 4 years & above. And that the recommended dose is 2-4 fruit gummies daily. 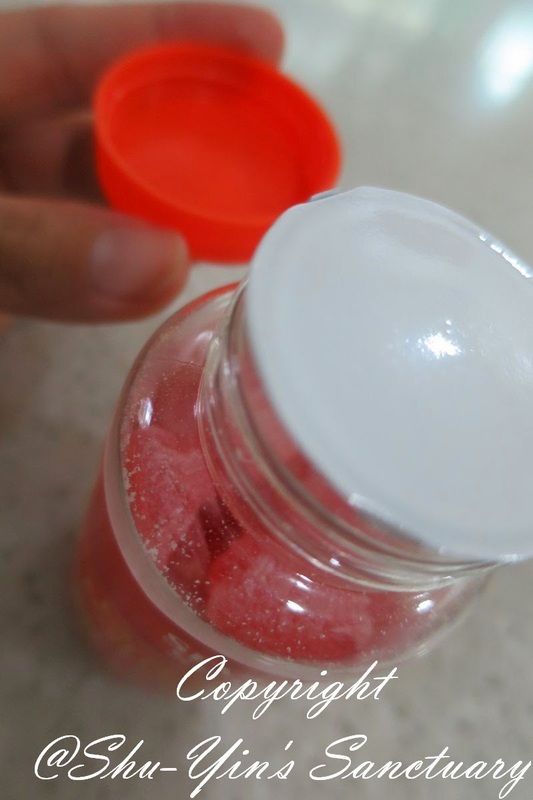 To maintain freshness, all the bottles are sealed with this white thick plastic in which you need to tear it off. 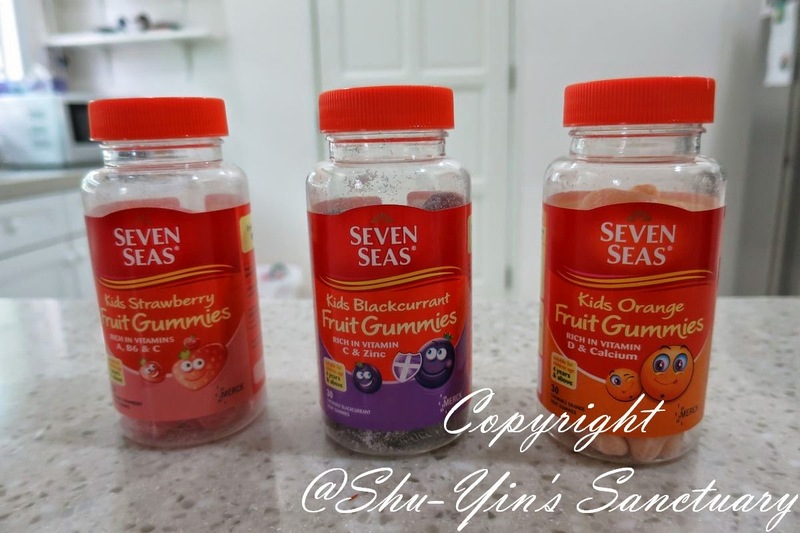 Available in packs of 30 delicious tasting gummies, Seven Seas Fruit Gummies come in three flavors, each enriched with different vitamins and minerals essential for the children’s formative years. 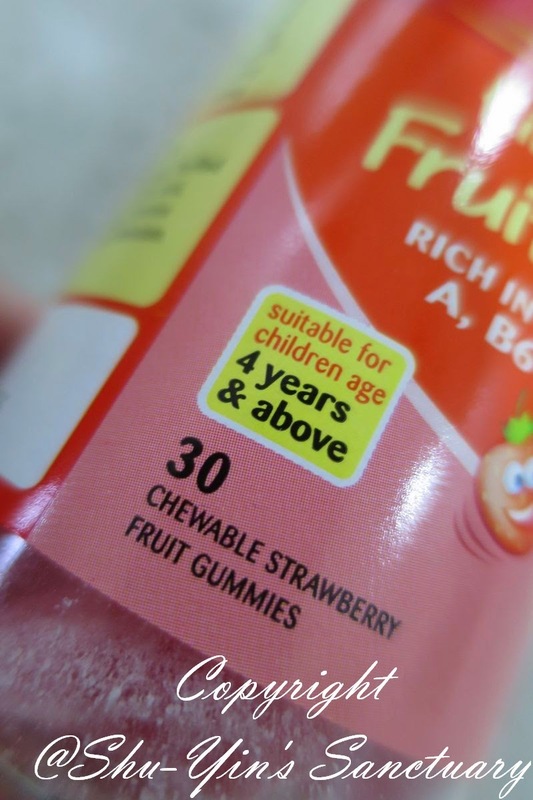 Strawberry Fruit Gummies contains Vitamins A, B6 and C, Blackcurrant has Vitamin C and zinc, and the Orange variant comes with calcium and Vitamin D.
All these vitamins and minerals are not only essential for good health but for children’s physical growth as well as their mental development. Vitamin A is fat-soluble and we all know that it is vital for healthy eyes but what is not so commonly known is that it protects us from allergies. As a powerful antioxidant, Vitamin A protects us from free radicals which damage our cells, tissues and organs. These damages can result in serious health problems when the children grow older. As an immune booster, Vitamin A keeps us free from infections such as influenza and colds as well as from viral diseases such as measles. 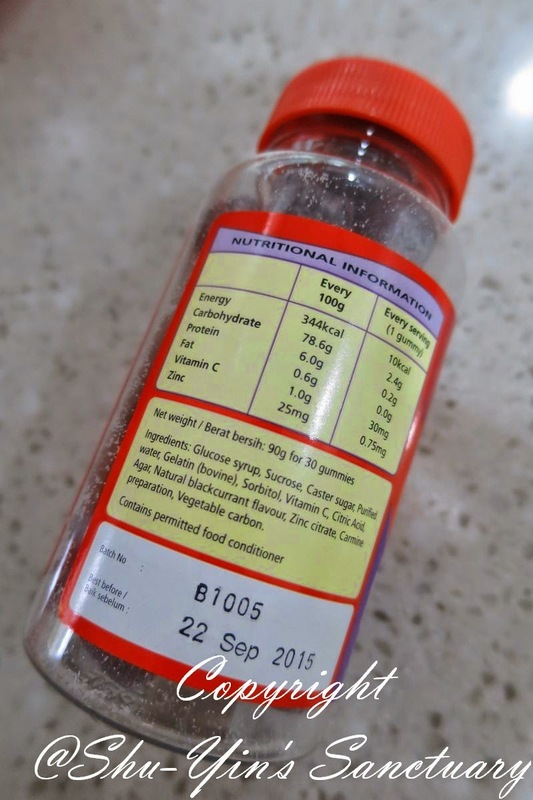 Vitamin B6 is another essential vitamin to keep our children's immune and nervous systems in peak condition. It is also needed to make hemoglobin which ensures that all tissues and organs get enough oxygen to stay healthy and to function properly. 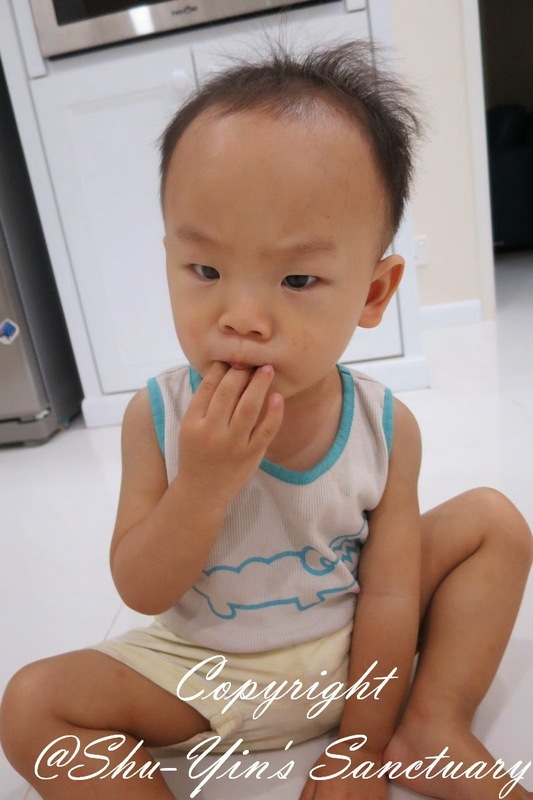 Vitamin B6 is especially important during the growing years as it is involved in the development of the brain. 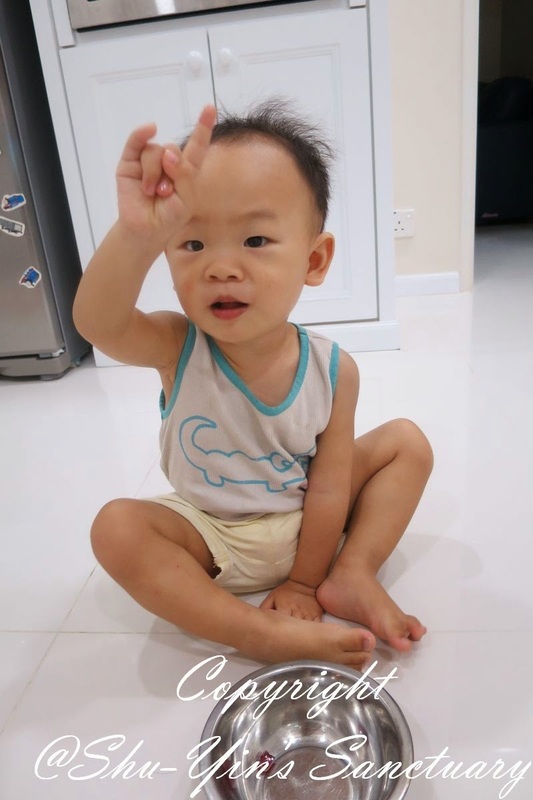 Zinc is just as important for normal growth and development during childhood as this mineral not only supports healthy cell growth but keeps the digestive system strong and improves digestion. Children are prone to cuts and lacerations and these will heal faster with zinc which helps in wound healing and blood clotting. Zinc will also give your children healthy skin and is naturally found in muscles, eyes, liver, teeth, bones, nails and hair. Like Vitamins A, B6 and C, zinc promotes immune function to stave off illnesses and is, interestingly, required for proper sense of taste and smell! Children, at their critical stage of growth, need lots of calcium when their bones are forming and to keep them strong through adulthood. Children who do not get enough calcium are more prone to bone fractures and weaker teeth as they grow. Intake of calcium alone is not enough. You must make sure that your children get sufficient Vitamin D to help in its absorption for proper bone growth and skeletal development. It is true that we get Vitamin D from sunlight but studies have shown that most children are just not getting enough of this essential vitamin and its deficiency can lead to bone-softening or rickets, a disease that is still reported in the U.S. Here’s another interesting note; Vitamin D pumps up serotonin, a natural mood-elevating, feel-good chemical. Finally, Vitamin C, the wonder vitamin. Vitamin C is an absolute must-have nutrient for your children. Besides strengthening their blood vessels, this wonder vitamin helps your child's gums to stay healthy, heal wounds and cuts, strengthens blood vessels, minimises bruising, form and repair bones, tissues as well as red blood cells. On top of all that, Vitamin C is a powerful immune booster to fight off infections. 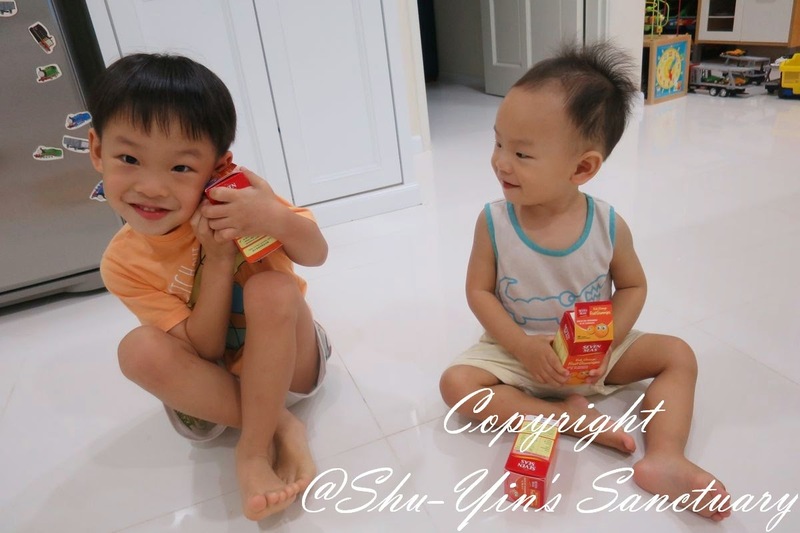 Look at how Shern grabbed the box of gummies so near to him. 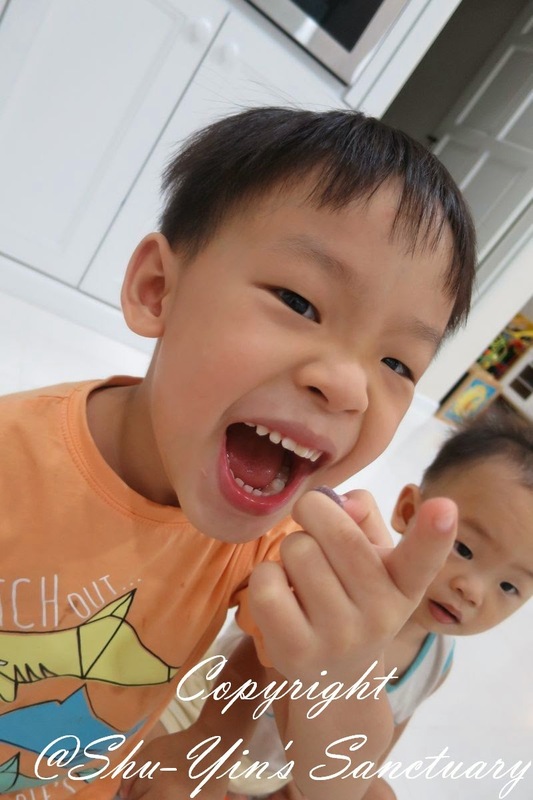 Khye looked at his brother doing that, and he tried to follow suit. haha. 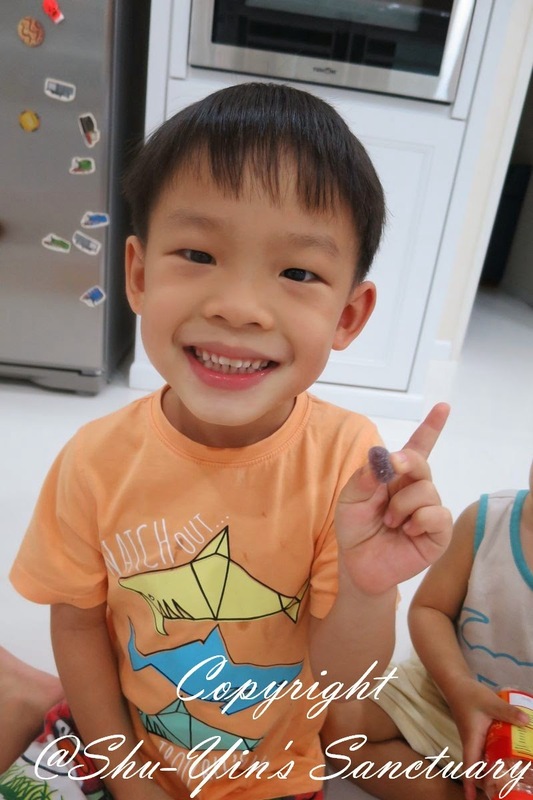 There is no need to ask which one Shern would choose first because knowing that his favourite colour is purple, I immediately knew that he would go for the blackcurrent flavour! 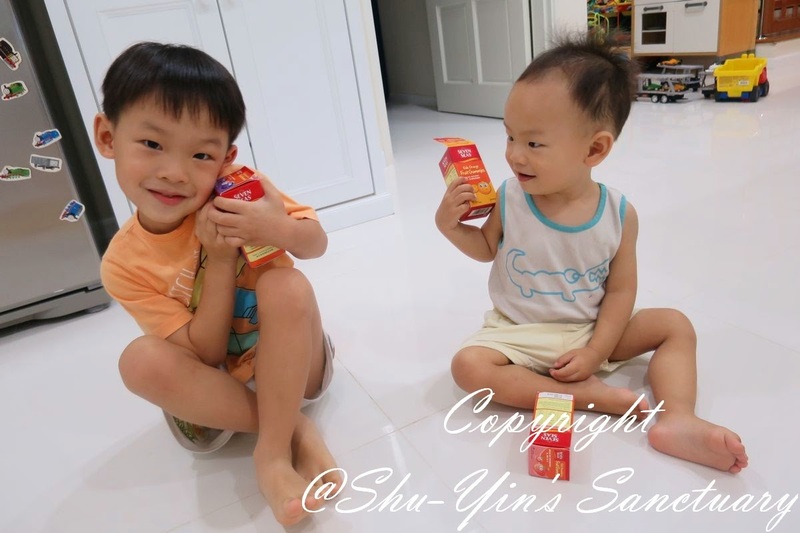 This is Shern trying out the gummies. Ready, get set, go, into his mouth it went and immediately he gave me a Good thumbs up sign! 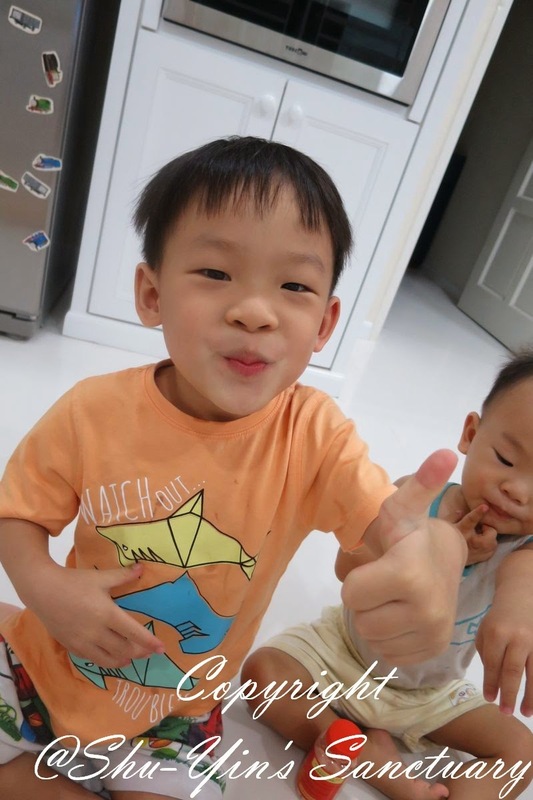 And since Khye saw his brother eating that, he wanted it too and fussed for it. Although I knew that this is only meant for kids above 4 years old, I figured out that mainly is because kids below 4 is not supposed to have sugar, and also gummies can be a potential choking hazard for younger kids. But to pacify Khye and also because both Shern and I was so hyped about it and I didn't want Khye to feel so left out, I cut the gummies into 4 small pieces to avoid it being a choking hazard. And remember the Activity Book that came with it? 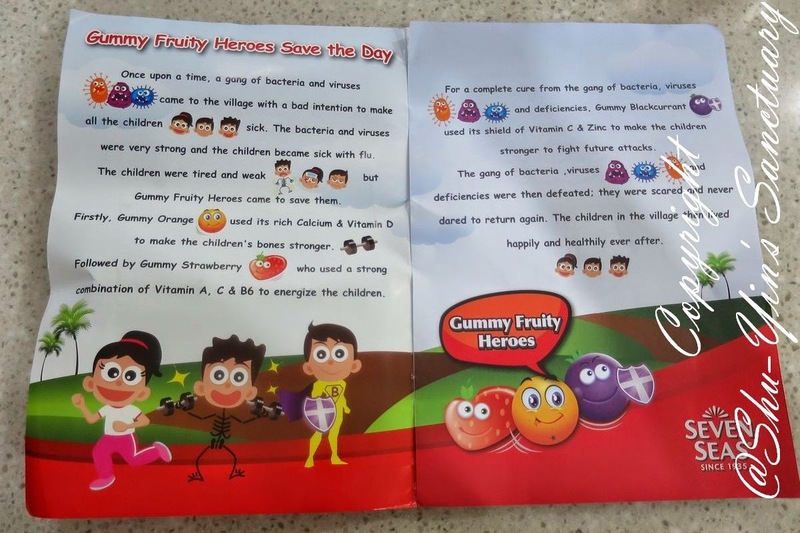 It is a fun and engaging booklet which tells and explain to kids like Shern the story of how vitamins (in this case the Gummies Fruity Heroes) help to fight off the bad bacterias and viruses. 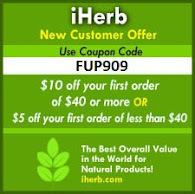 Is really a good way to let Shern understand the benefit of taking vitamins. 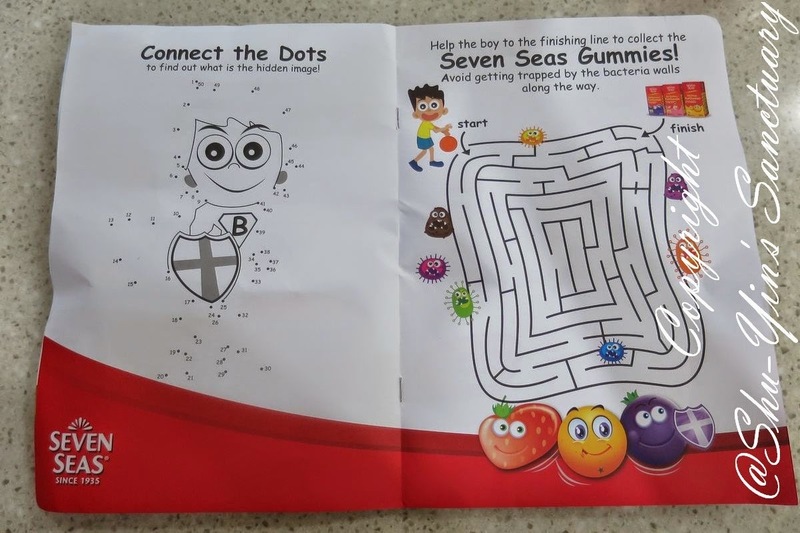 It also came with some activities (which Shern loves), like connect the dots, puzzles and such. I took it out with me to a cafe outing, and Shern had fun doing that while waiting for our food. Kills time while Shern had fun! 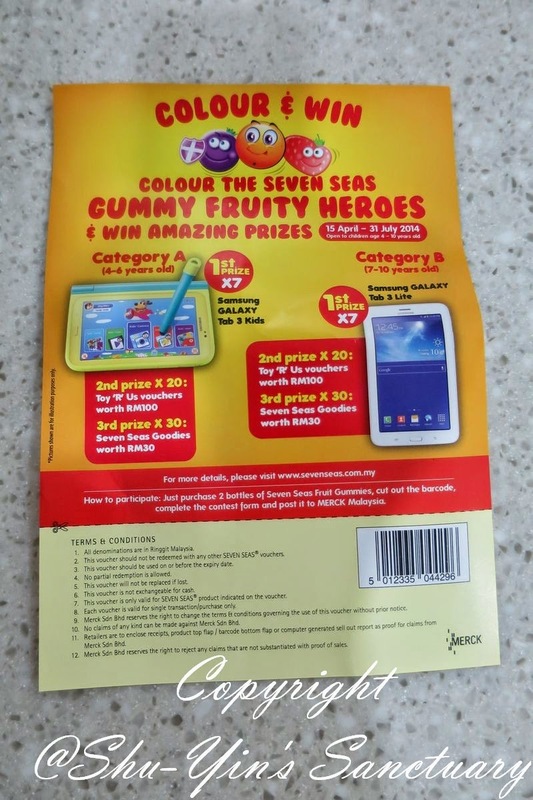 Seven Seas is currently running a nationwide 'Colour & Win' contest. You could let your child(ren) (Open to children ages 4-10 years old.) 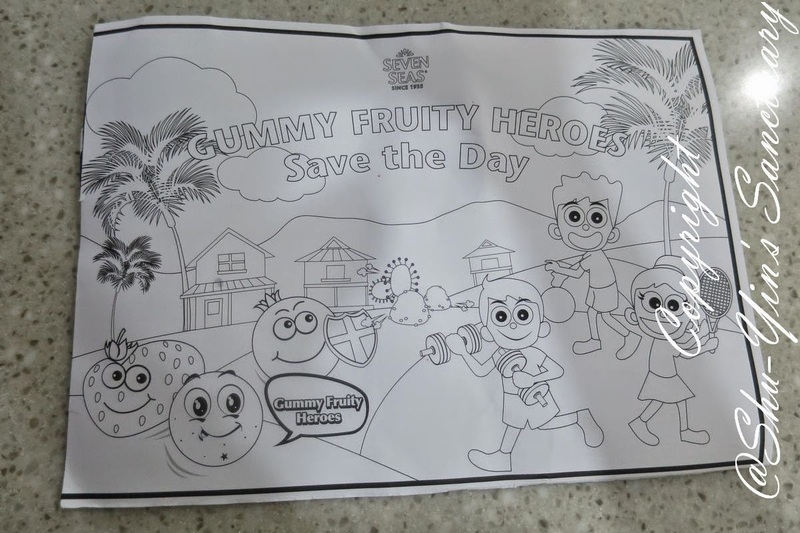 participate by colouring the Seven Seas Gummy Fruity Heroes on the contest form and stand a chance to win a Samsung GALAXY Tab 3 Lite/Kids or other goodies. Please download the contest form here. 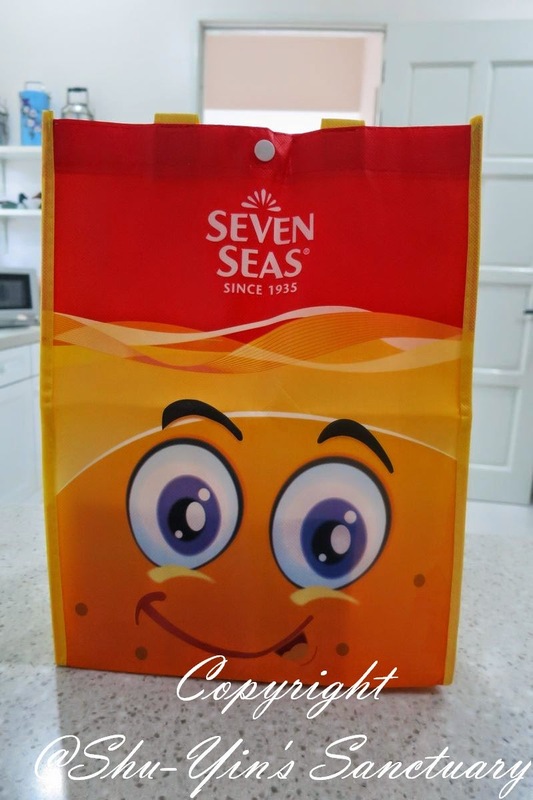 For more information about the product, please visitwww.sevenseas.com.my. I let Shern pop 2-3 gummies a day, but I give him different flavours, so that he gets the different vitamins. But I think a little sugar doesn't harm much. And it is definitely way healthier than sweets or chocolates! Besides these, I do let Shern takes multivites too, and also Manuka honey, and all of them are sweet! haha. 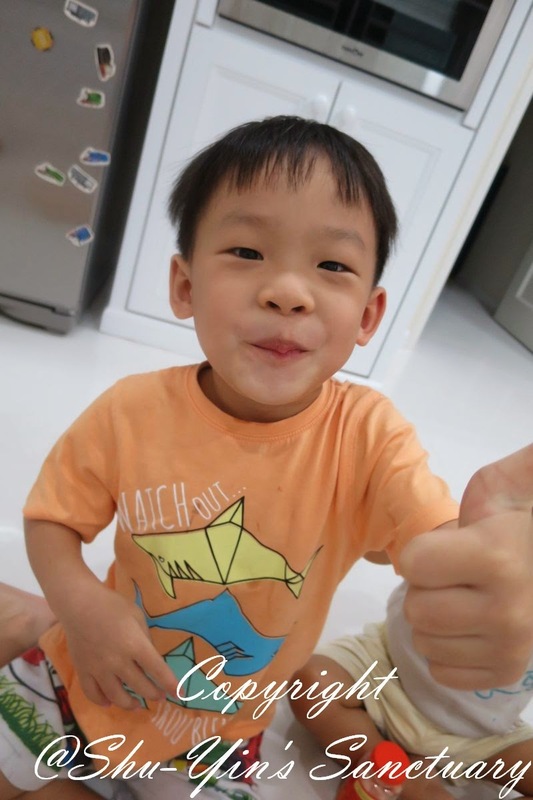 I guess sweet appeals to kids and imho, it is better for them to have a little sweet, than to not take any vitamins at all, unless of course if your kids is not a picky eater and eats his fruits and greens. So I need to turn to vitamins to build up his immune system, and thus this is a great choice for us! 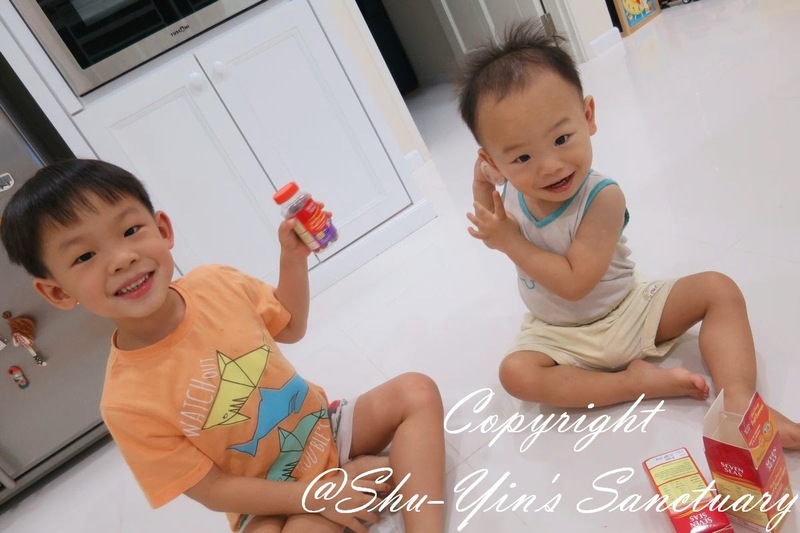 Let me end this post with a photo of Shern enjoying his gummy! - You can purchase at leading pharmacies in Malaysia nationwide. 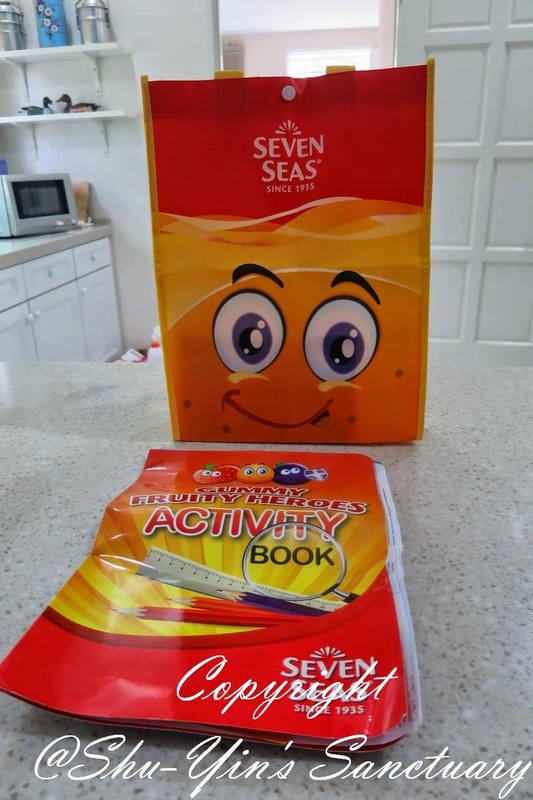 You can also visit Seven Seas Malaysia Website for more info. 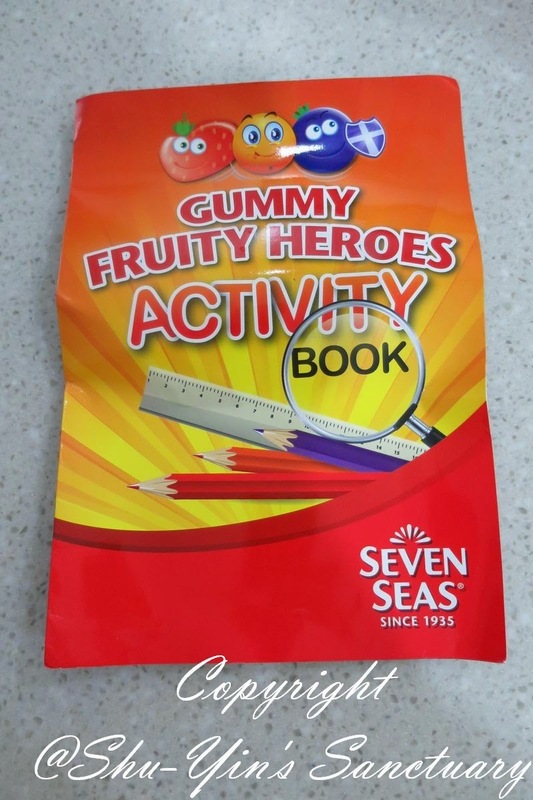 * Disclosure: I received Seven Seas Fruit Gummies for review purpose, but no monetary incentive was received. All text and opinions are of my own and represents my honest opinion of the product(s).